It was one of those drinks that will creep up and whack you over the head if you’re not careful! Delicious!!! Next, to the Jenisons for a tasty but healthy salad with heavenly home-baked wheat bread. Salad course at the Jenisons’. Ramon is taking the picture. We then moved on to our home for the entrée before hopping across the street to the Rutherfords’ for a variety of sinful desserts, coffee and after-dinner drinks. I went to the doctor the day after for a routine check-up. I had gained 2 pounds from the previous week, and my blood pressure was up. Uh….duh!!! I wanted to do a really dramatic, special, over-the-top tablescape to thank my neighbors for their kindness, generosity and goodness of heart throughout the year. Two 6-ft. tables placed together horizontally are covered with full-length white linens in our family room. I love the double charger treatment, so a sparkly red 13″ charger (Target 2008) is topped with a goldtone 12″ (Hobby Lobby). 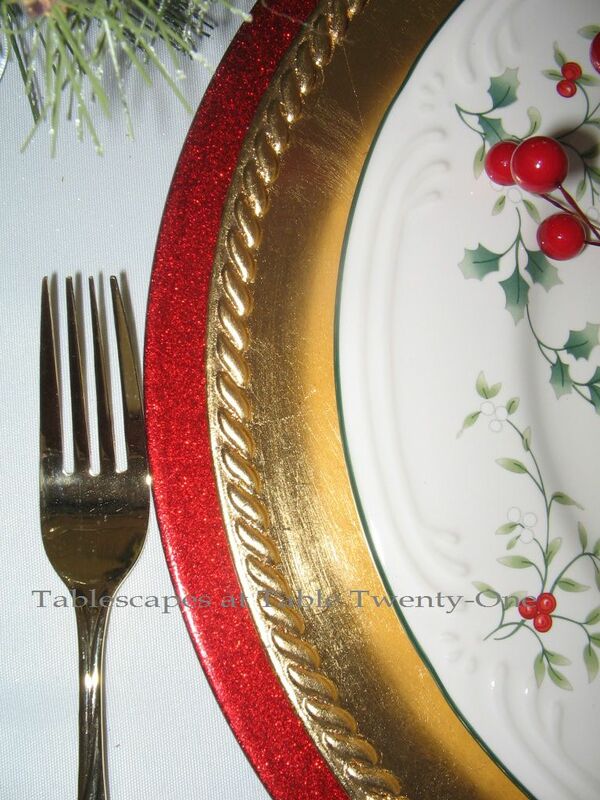 The dishes are Pfaltzgraff’s wonderfully traditional “Winterberry” which is one of my favorite Christmas designs. I like to use our initialed linen dinner napkins whenever possible. For this night I dressed them up with a red berry napkin ring. I just used a standard berry stem from Hobby Lobby that I twisted to encircle the easy, classic napkin fold. 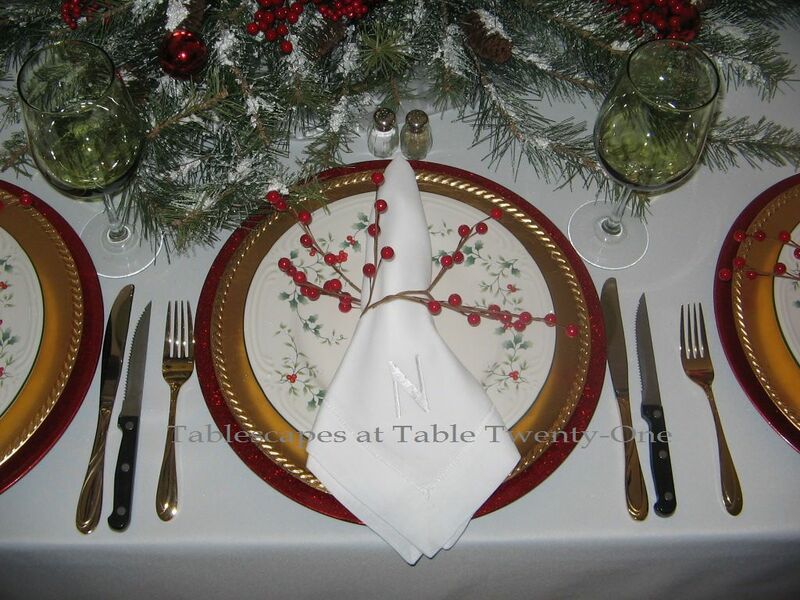 LOTS of color and dimension, and it adds a little more height to the place setting!!! 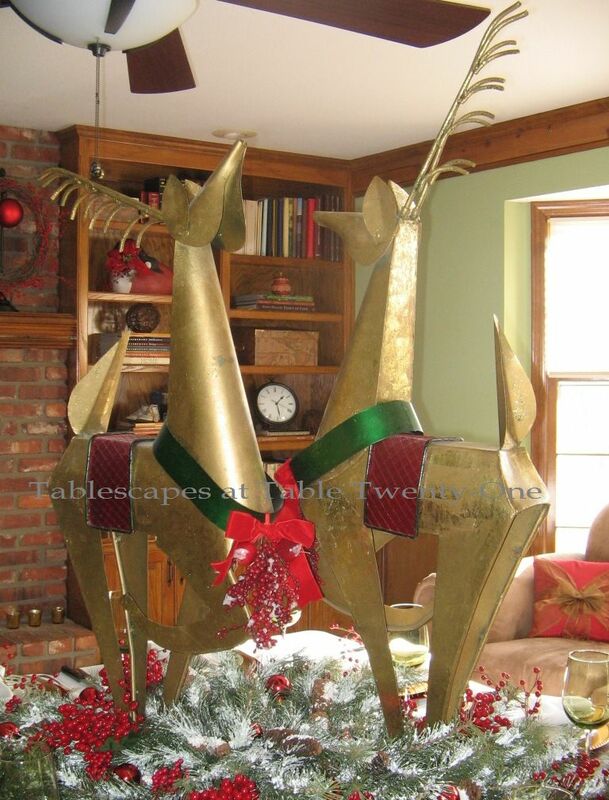 I bought these rockin’ gold metal reindeer wholesale many years ago when I owned my fine rentals business. They measure 36″H without the antlers, so they’re perfect for the “go big or go home” look I love so much. I covered the center of the table with a couple of clear plastic trash bags to keep the linens underneath clean. I dressed each for the evening with a collar of berries with a red velvet bow. 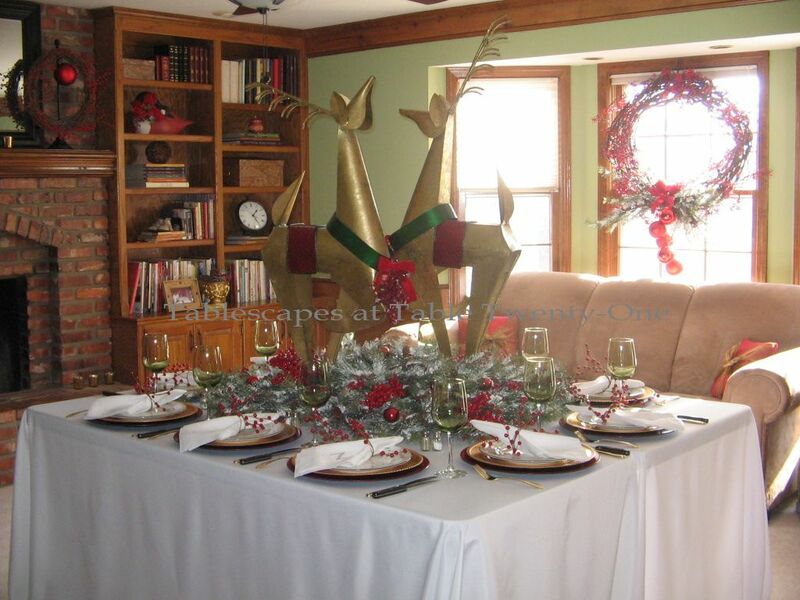 (To see last year’s cul-de-sac progressive dinner – dressed up with different reindeer decor – click HERE and scroll down to “Noel Progressive Dinner“. I painstakingly placed each branch of this flocked pine cone greenery to create a sort of wreath to cover the reindeer stands. 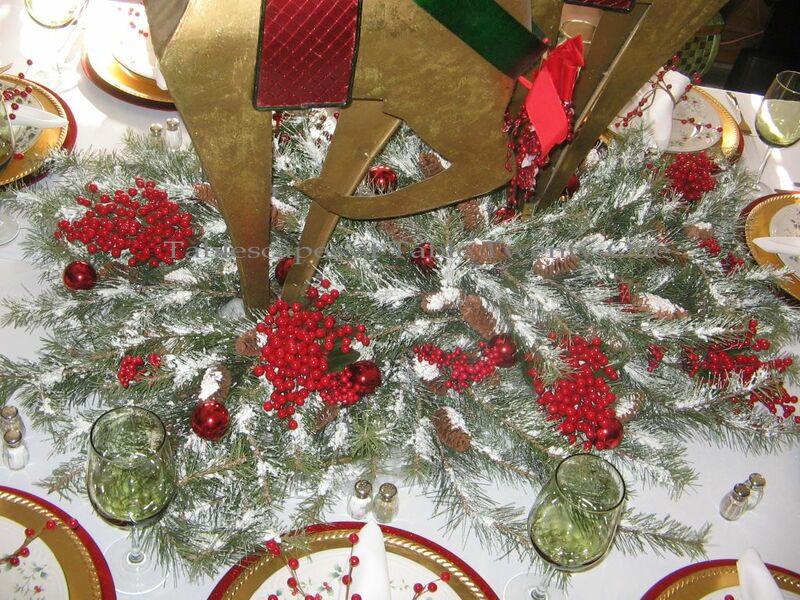 Red berry picks and shiny red Christmas ornaments finish off the fun yet sophisticated reindeer centerpiece. 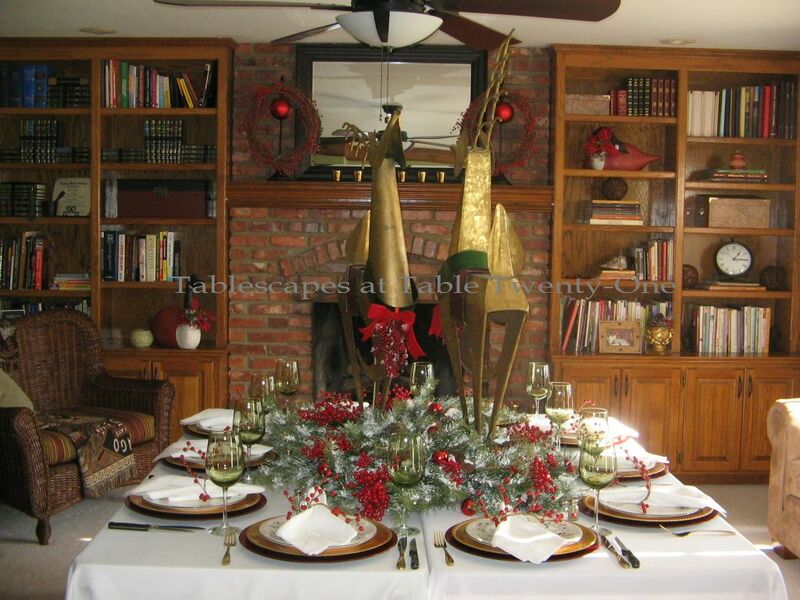 We were dining in the family room, so I dressed the top of the television armoire to complement the table with this small reindeer and lots of lighted greenery punctuated with red berries, ribbon, and ornaments. The grapevine wreath in the window is covered with a profusion of red berries and finished off with a few flocked faux branches, pinecones, oversized Christmas balls and red velvet ribbon. 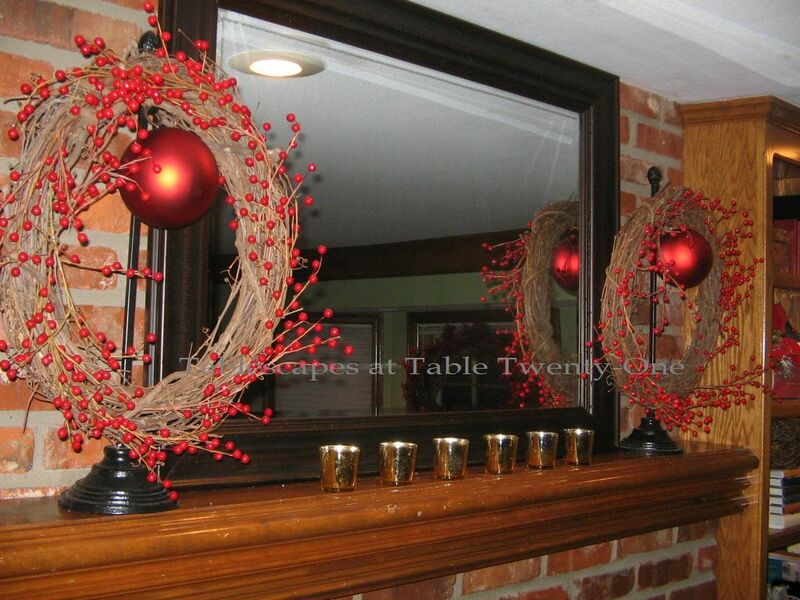 I kept the mantel simple with two smaller grapevine & berry wreaths. 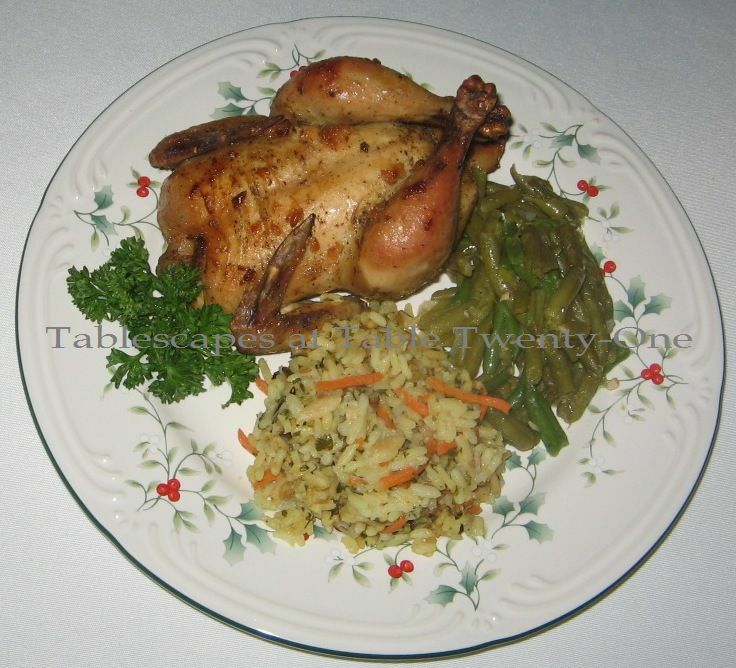 Oh, and in case you’re wondering about the menu…Cornish hens basted in a garlic butter sauce, wild rice and green beans. Our neighbors, Carla and Jim, were unable to attend this year’s dinner but sent over homemade cinnamon sugar-dusted Parker rolls. So another year, another wonderful Progressive Dinner with fine friends who we love and cherish. God is good! From our homes to yours, have a very Merry Christmas!!! Please join me again this week for Tablescape Thursday over at Susan’s Between Naps on the Porch! That progressive dinner sounds like a lot of fun. Love your winterberry dishes too-I’ve always admired those! Your cornish hens, rice and beans look so darn good! I haven’t made cornish hens in years! I was wondering how a progressive dinner works! Thanks for explaining! I live off a county road and not in a subdivision. Love the wreath in the window with the cascading ornaments! Looks like you’ve gotten your mojo for Christmas!! I LOVE progressive dinners…haven’t been on one of those in years. Looks like a great evening! Wonderful neighbours are such a treasure!! Those reindeer are really making a statement! Your attention to detail is evident in everything you do. It must be a blast being your neighbor. Merry Christmas!!!! Beautiful job! Isn’t is wonderful to have great friends to share a meal with? I haven’t done a progressive dinner in years, I think I might have to zoo if I can put o e together! I love the simplicity of the berries and greens. And the reindeer…HUGE! Like very much. A happy, lovely and inviting Christmas table. Yum ! Everything is just lovely ! What fun Alycia! I love your prancing reindeer ♥ Your food looks delicious and I could make a meal alone out of your appetizers!! How beautiful! I love the reindeer and your plates are lovely. I saw blue stemware at Dollar Tree last week! Thanks for your comment, I had a 25% off total purchase coupon, so that’s how the flatware was on sale:) Have a great week!! BRAVO! Love the Reindeer. They way to cool. Dollar tree is a surprise and a nice one at that! You’ve got me checking on things in there now! Beautiful and inviting table. Merry Christmas Alycia! You are one talented lady!! Everything is so beautiful. I love the reindeer. Thanks for sharing your lovely table. 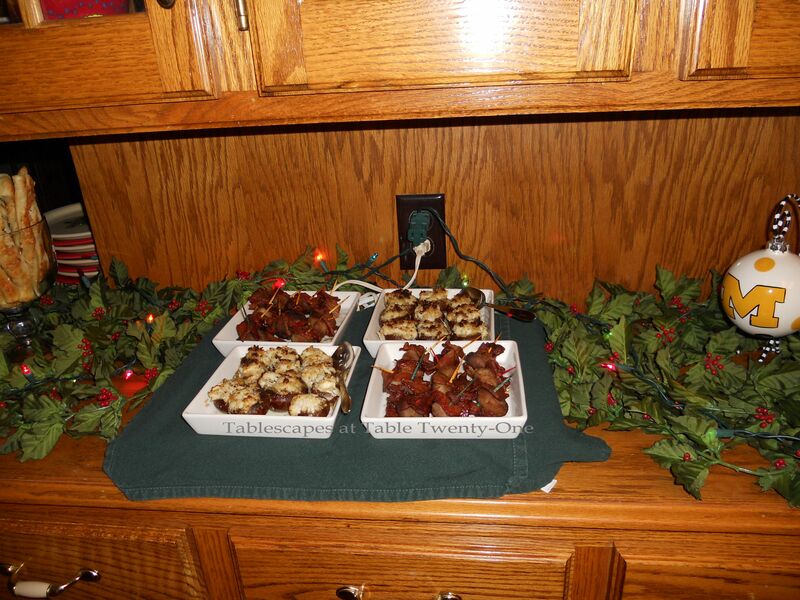 Your tabletop reindeer and stunning! Your tables ALWAYS have that WOW factor. Beautiful. I’m not sure that I would have noticed if you served hot dogs! Those deer are amazing Alycia! Gorgeous table, wonderful food, good company! Now, that is a centerpiece! Holy Molly. Love the Reindeer…Progressive dinners are so much fun with friends and neighbors. The dinner looks yummy and the dishware is lovely. Isn’t the Dollar store wonderful? It’s always a pleasure to see what you do Alycia. No worries about gaining weight around the holidays. I have gained some too. With all of the parties, baking, how can one not? Happy Holidays…. Wow! Those are reindeer with attitudes> LOL. They really make a statement…a good one. What fun to have neighbors who love to entertain. 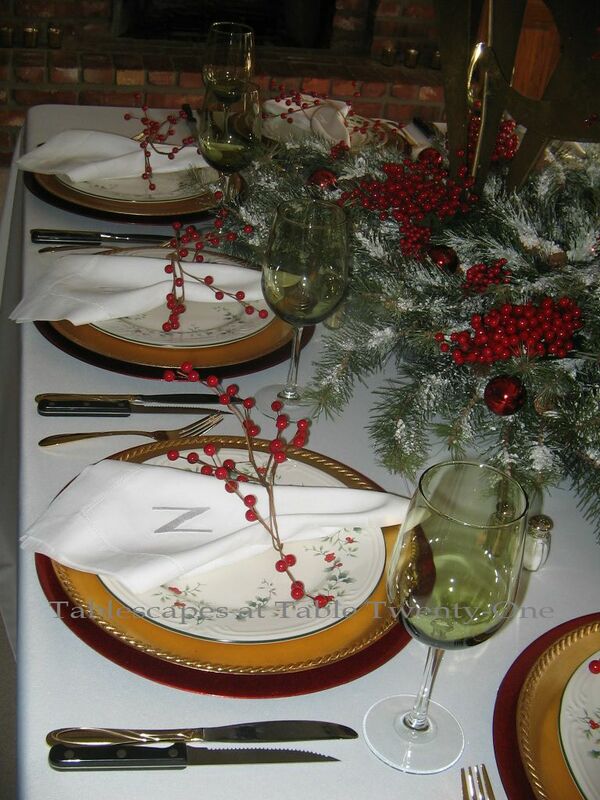 Your tablescape looks so pretty and the wreaths on hanging stands is a great idea for the mantel. Yummy, yummy cornish game hens. Thanks for the “invitation”. What a fun dinner and such a beautiful table. 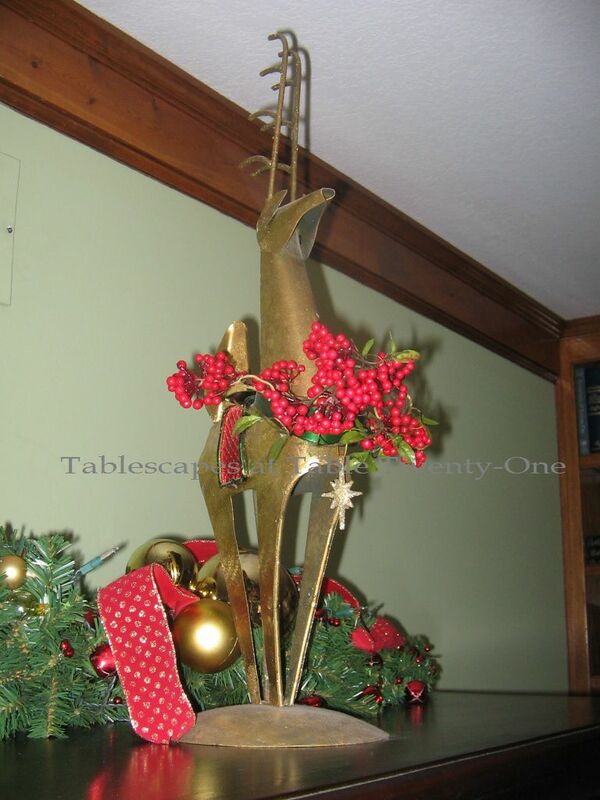 Those reindeer are showstoppers and certainly let everyone know how much you love them. We just did a progressive luncheon today and it was so much fun to see how everyone has learned from reading my blog and tablescaping! Today they wanted to learn how to photograph their tablescapes. I showed them how and we had a great time. What a wonderful Christmas tradition and every course looked wonderful (but where are the desserts????). I LOVE your Christmas dishes. Your whole table was wonderful. Thank you for sharing your party!! Beautiful!! Those reindeer are def a showpeice and I love all your berry decor as well. Now I am hungry — I really have to stop looking at food late at night. We used to have progressive dinner parties in our old neighborhood — I miss it. Oh I wish I new my neigbors well enough to start this. It sounds like so much fun and I’m sure it was a lot of work too. Everything looks fantastic. I love the reindeer! What a nice way to celebrate the beautiful holiday season! 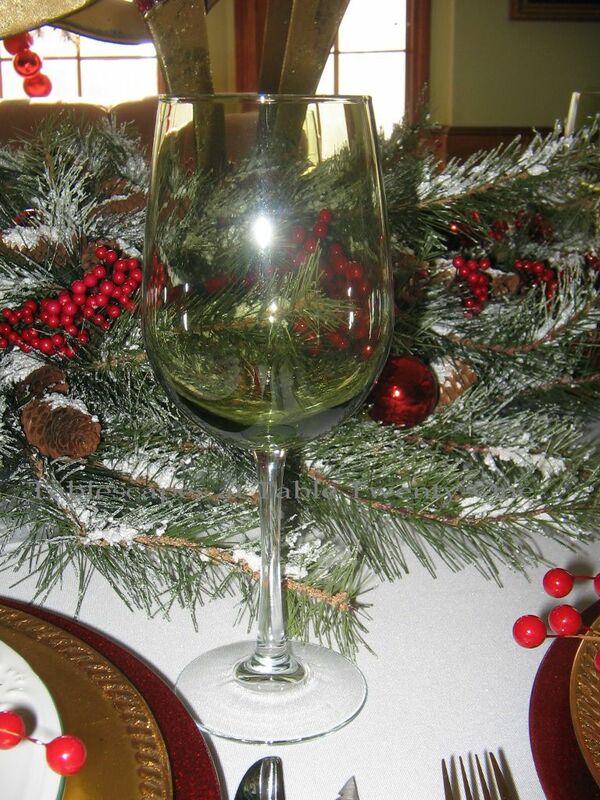 I must say that I also love the soft green stemware from the Dollar Tree. I use mine several times a year, and they are a perfect color green. Hi , thanks for visiting me ! Love your center piece . Don’t ya just love Dollar tree for bargains . Love the reindeer too . I have always wanted to do a progressive dinner. Sounds like lots of fun. Graciousness… I would love to grab those 2 deer. OMG!!! and the food, YUMMY. So, much warm in your home. Love to be with you guys! Alycia, I have to award you (no money, just acknowledgement) the most dramatic centerpiece of the season! Those deer are fabulous! The double chargers look great (I never thought of that) and your Dollar Tree glasses are awesome! Both my sister and I used them this week, too! I just love the shade of green and the pretty shape, and how can you beat that price! 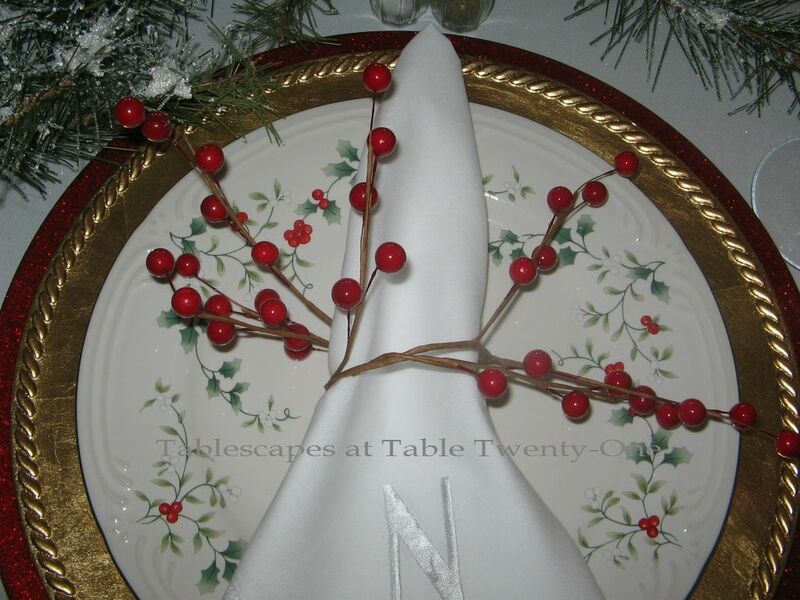 The berries are a lovely addition, and I like the understated but elegant linens. And, your entree looks wonderful! I’m sure your neighbors were delighted with all of it! I love that set up, nice and roomy, and the setting is so pretty! Go big, or go home, lol! You are funny! Have a great weekend, stay out of trouble if you can, watch out for reindeer! Beautiful dishes and I love the grapevine wreath! And those reindeer? Impressive. Thanks for stopping by my blog! What great fun! I haven’t been on a progressive dinner for ages, but always remember enjoying them thoroughly. Your table looks lovely. 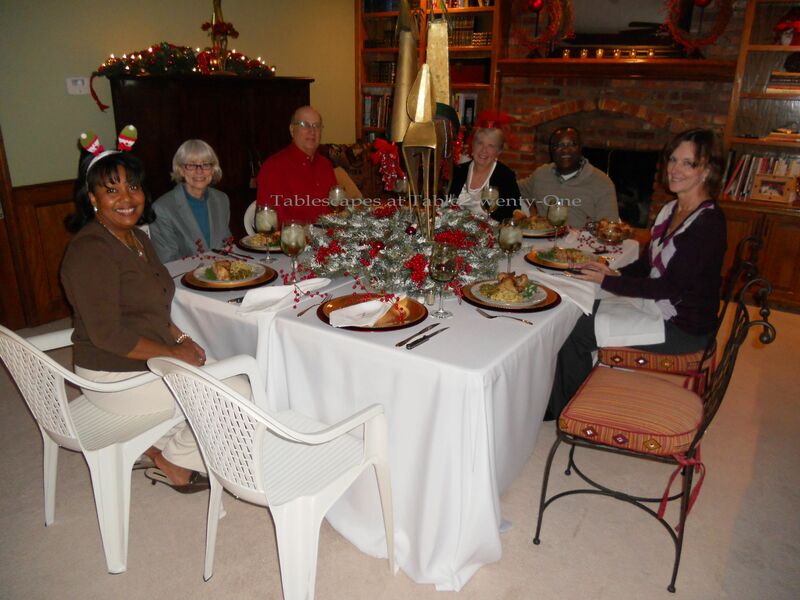 Your tablescape looks very beautiful and I love the centerpiece. For 12 years, my husband and I belonged to a dinner group. It was so much fun and we had such delicious meals. Thank you for stopping by my blog and leaving such nice comment. Have a wonderful Christmas! What a festive table! Thank you for stopping by and leaving a comment …comments warm my heart anytime of the year so please do come again. Happy Holidays to you as well. This sounds like such fun! I have never been to a progressive dinner but I think it would be fun to participate in. Your table is gorgeous! I think I’ve got that same garland on top of my breakfast hutch. The reindeer are so cute. I was browsing some of your posts and LOVE the pink birthday post and table you did for your friend…I think her name was Shelly…oh I loved that table and the food looked wonderful too! What a wonderfully fun tradition! Your table looks beautiful (as usual). That Pfaltzgraff pattern is one of the prettier winter patterns. I really like it,too. What a great night. I love progressive dinners. LOL at your comment on my burlap runner. Boxing Day is a throwback from Australia’s English colonial heritage. Basically servents worked hard on Christmas Day for their masters and then the day after (Boxing Day) they were given a box of money/gifts and the day off. In modern times Boxing day is really just a public holiday so you can recover from Christmas and the first day of The Boxing Day cricket test in Melbourne (another English pastime!) It’s also the first day of the Christmas sales. Thank you so much for your both comments to my posts. I gave my mom your message and she was trilled and she sends her loves to you. Have a belated Merry Christmas and Happy New Year with your loved ones. As you know I am Christian and I celebrate xmas as well we had a family dinner at my moms and celerated both her b-day and xmas at the same time. On New Years all family and friends will be at our house for a dinner party and its my husbands b-day 31st so we again celebrate New Years and a b-day at the same time. Your dinner partys looks beautiful again.